Everyone loves a good dip, right? This mean kidney dip was not only hit on the Halloween table, but this mean kidney dip goes well with the Scandinavian Friday tacos too. It disappeared quickly from the table at our house. And you will love how easy it is to make. If you want to make it with non-canned kidney beans, just remember to soak them overnight. I prefer to cook my own beans, but it takes a lot longer. If you use canned ones, just make sure you rinse the beans well before using them. This mean kidney dip is a bit spicy, but you can, of course, use more or less chilli. Some like it hot and some not. Personally, I like it when it’s packed with flavours, but not when it’s hot. 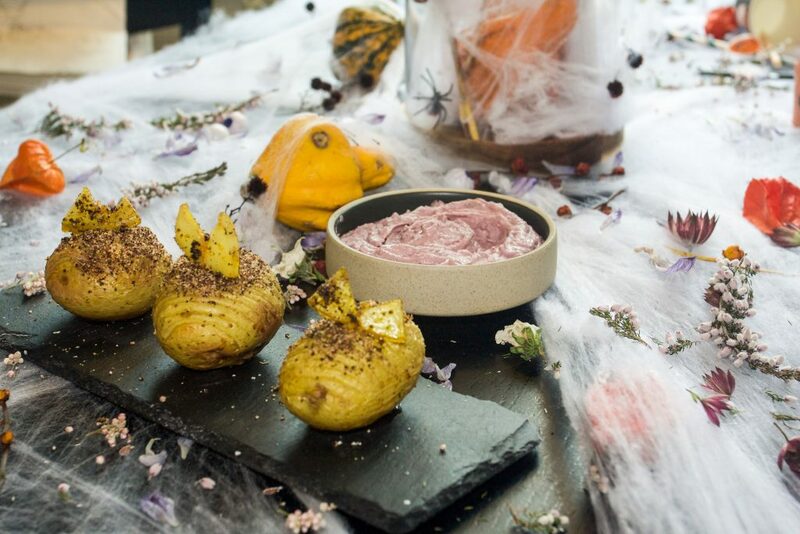 I also made the classical Swedish Hasselback potatoes and made little bats out of them. I really love potatoes and Hasselback is such a delicious way to eat potatoes.